Kitschy Kitschy Coo: What Could Be Bedda Than Hedda? What Could Be Bedda Than Hedda? 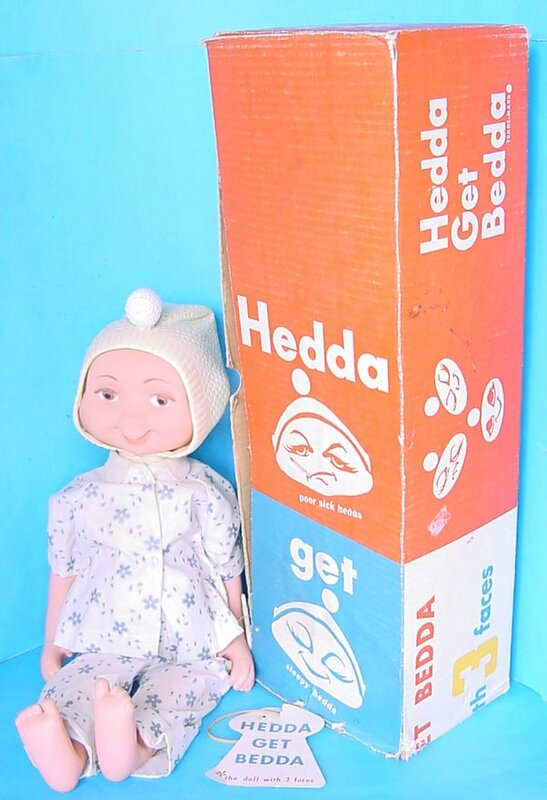 Hedda Get Bedda, one of the American Character Whimsie series dolls made in 1961, is a three-faced doll. You turn the knob on the top of her non-removable bonnet to see all the faces/phases of her disease. Creepy, ey? This doll would send my sister into deep psychological scare. According to DollInfo.com, these dolls were marketed to the pre-teens and teenagers who were getting "too old for baby dolls". If anyone can move past the two-faced to the three-faced, it's pre-teen and teenage girls. Very fun title...interesTing collectible too!